Characteristics: Double glazing (20mm) with thermal and acoustic insulation properties, aluminum frames, use of designed parking area, no bottom guide. Top, bottom and side insulation with brush seals.. Basic Dimensions: 105mm for upper and lower aluminum profiles, aluminum track size of 60x53mm or 75x72mm (heavy type), 50mm total width of intermediate vertical aluminum frame. The F3 folding door system was the first system ever designed to accommodate double glazing. The double glass boards are contained within an aluminum frame for better insulation and durability in more demanding and challenging environments. It is therefore ideal for large openings where additional insulation, robustness and safety are desirable. Each pane is secured and locked with latches and/or floor locks, and can be modified to adapt to any flooring and floor morphology, as well as any other particularity. Any pane can also be turned into an opening/divertible door, functioning as an entrance, once a roof spring mechanism is fitted in. Such entrances can be both single and double winged. Water tightness between the panes is achieved by using bubble-shaped elastic gaskets, while, around the edges, where the construction meets the surrounding walls on the sides, the F3 uses winged gaskets to seal up all gaps. Its upper and lower profiles bear special insulative brushes which cover all other gaps efficiently enough to keep the construction watertight and insulated as well as possible. 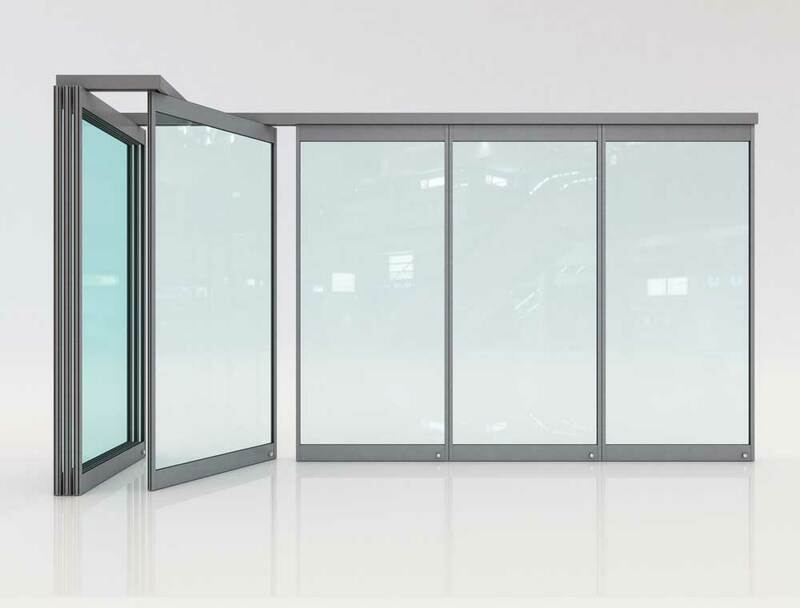 Double-glazing, folding door system with a wide range of applications, such as shop fronts, perimetric enclosure of exposed and unsheltered constructions (i.e. pergolas), entrances to hotels, restaurants etc. Thanks to its double glazing and aluminum frames, this system guarantees great results in more demanding and challenging environments. Design flexibility: Total flexibility regarding the configuration of the parking area, as well as the number of panes. Protection against outdoor conditions: : Thanks to its double glazing, the F3 systems offers thermal and acoustic comfort, in comparison to single glazing systems.